The CPC temperature forecast for the winter indicates warmer than normal in the north and colder than normal in the south. Forecast courtesy of NOAA. On October 15, NOAA’s Climate Prediction Center (CPC) issued its winter 2015-16 (Dec-Feb) forecast for temperature and precipitation over the United States. If the prediction is correct, many citizens of the northeast will breathe a sigh of relief, and those in southern California will see some improvement in the drought conditions. Overall, El Niño Eggplant (Decoded Science has given this El Niño a name), currently the third strongest equatorial Pacific warming on record, is driving the forecast. But there are always many facets to the weather, and though Decoded Science concurs in general with the forecast, there are caveats due to anomalous conditions in another part of the Pacific Ocean and the arctic.. The most noticeable temperature effect is across the northern states, as the warm flow keeps colder Polar air locked in Canada. Across the south, where cold air doesn’t penetrate as often, temperatures tend to be below normal due to the increase in cloudiness. The CPC forecast is given in probabilities (don’t we all just love those). The percentages provided are actually difficult to interpret quantitatively, so the map should be considered to be a qualitative assessment of the winter temperatures. The greatest likelihood of a warmer than normal winter is across the northern tier of states, and the greatest chance for below average temperatures is in the south-central and southeastern states. The CPC winter precipitation forecast indicates wetter than normal in the south and drier than normal in the north. Forecast courtesy of NOAA. The Pineapple Express is not only warm, it’s wet. Moisture from the tropics and subtropics works its way into the jet stream and falls as rain or snow across the United States. The forecast for drier than normal weather over the northern states stems from the following reasoning: The primary jet stream will be pushed north into Canada, so storms, which provide the lifting mechanism to produce precipitation, will be less frequent. Storms may be less frequent, but when they occur they will be able to tap the increased moisture in the Pineapple Express. The storms that do form will drop heavier amounts of rain, simply because more moisture will be available to them. In addition, the polar vortex has tended to take up a more equatorward position as the arctic warms. A southern excursion of the jet stream has caused the two brutal winters in the northern US the past two years. This change in the general circulation has largely taken place since the last powerful El Niño. Decoded Science feels that the southward displacement of the jet stream is not adequately accounted for in the CPC forecast. Decoded Science has been reporting for three years on the anomalous pool of warm water in the Gulf of Alaska, and has linked the west coast drought to its influence. Meteorologists have taken to calling this warm water pool ‘The Blob,’ and though Decoded Science doesn’t think this is a fitting name, we will use it for the sake of convenience. The Blob heats the air above it and induces high pressure in the area. As the air warms it expands and produces a ridge at jet stream level. The resulting jet stream flow is north over the ocean and south over the continent. The result at the surface is warm high pressure over the western states and cold air with intermittent storms in the east. The Blob has not gone anywhere and has been competing with El Niño for control of the weather pattern during the summer. Each side has had its moments; the result has been changing patterns that we gave the names Hotzilla and Westzilla. The former had the jet stream locked up far to the north with high temperatures and abundant rainfall across the US; the latter saw ascendance of the Blob, with record temperatures in the west and cooler temperatures in the east. The Hotzilla pattern is basically what happens during an El Niño. Often a weaker southern branch of the jet stream links with the Pineapple Express. Such a pattern brought record rains to southern California a couple of times during the summer. Summer and winter weather patterns are distinctly different, with a much more potent jet stream during the cold months. All factors considered, Decoded Science believes that the weather pattern will continue to change between one in which El Niño is in control to one for which the Blob is the primary driver. The midwest and northeast may have some storms, but there should be periods of warmer, though possibly wet, weather in between. NOAA’s seasonal drought outlook through January 31 indicates improving conditions in the southwest but worsening conditions in the northwest. Decoded Science believes drought conditions will improve everywhere. Forecast courtesy of NOAA. 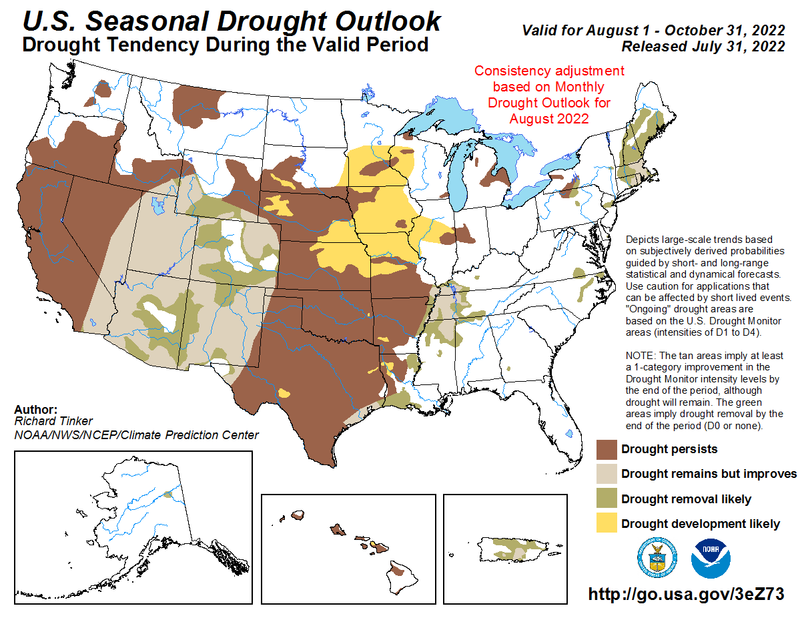 NOAA issued a winter drought outlook along with CPC’s temperature and precipitation forecast. The map shows improvement in drought conditions in the southwest, but worsening conditions in the northwest. This is a result of the precipitation forecast, which Decoded Science believes is wrong in the northern states, where incursions of the jet stream will bring storms with rainfall enhanced by tropical moisture. Though we are forecasting some relief due to increased precipitation in the northwest, the summer water supply depends on snow melt. The warmer temperatures forecast this winter will raise the snow level, so that even though there might be more precipitation in total, less of it will fall as snow. Drought conditions could then worsen for the summer. The statistical correlations of past El Niños with temperature and precipitation over the United States are well known. However, since the last significant El Niño, there have been some changes, namely the southward displacement of the polar vortex and the persistence of The Blob. As El Niño Eggplant reaches its peak this winter, the jet stream becomes active, and The Blob persists, we are likely in for a meteorologically interesting few months. How does a weather Forcaster know or predict when the jet stream moves to the south?? Very interesting (even apart from the names). It would be great if you could obtain a video camera and make simple videos for the Decoded audience. I would love, especially, the pointer demonstrating the activity of the weather controlling features, e.g. the blob, The videos would not need to be fancy, as in a TV production, but used as one might expect in a science classroom. Thumbs up.